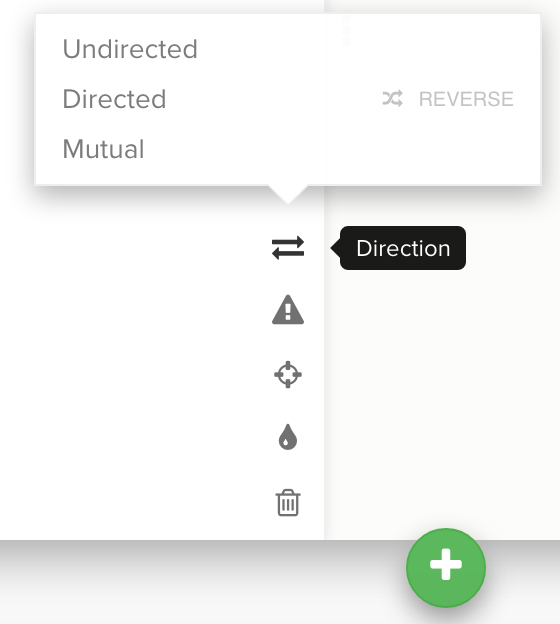 Use the direction icon in the side panel to specify "Directed", "Mutual", or reverse the connection direction. Click "Directed" to add a connection arrow, and "Mutual" to add an arrow on each side. Press Shift + C on your keyboard to select all connections. Click on the direction icon in the side panel. Click "Directed" to add arrows to all connections. Arrows can&apos;t be added to connections if you&apos;re using the SNA template. Kumu recognizes connection direction from your spreadsheet import (From and To columns in your connections sheet) or the direction you draw the connection by hand. This connection direction determines which way arrows point when you specify a "directed" connection. In a JSON blueprint, you can use the directed property of each connection to specify &apos;directed&apos;, &apos;undirected&apos;, or &apos;mutual&apos;.